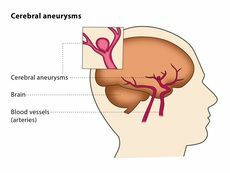 Brain aneurysms are often discovered when they rupture, causing bleeding into the brain or the space closely surrounding the brain called the subarachnoid space, causing a subarachnoid hemorrhage. Subarachnoid hemorrhage from a ruptured brain aneurysm can lead to a hemorrhagic stroke, brain damage and death. The main goals of treatment once an aneurysm has ruptured are to stop the bleeding and potential permanent damage to the brain and to reduce the risk of recurrence. Unruptured brain aneurysms are sometimes treated to prevent rupture. Learn more about treatment options for a brain aneurysm. Intracranial aneurysm treatment, by either surgery or endovascular coiling, may precipitate a complication that could lead to new symptoms, disability, or death. In comparing procedural risks, a measure of complications caused by the treatment itself would be ideal so that the impact of the therapy could be isolated from other aspects of presentation or medical care. For example, brain injury from subarachnoid hemorrhage at presentation or from aspiration of gastric contents during airway manipulation may lengthen hospitalization or result in disability, and these complications could obscure the impact of the procedure itself on outcomes. However, determinations of what "procedure-related" means are subjective and require judgment; hence, "measurements" of procedure-related complications are unreliable. In formulating these guidelines, we have favored comparisons of functional outcomes when available in the literature. Functional outcomes after subarachnoid hemorrhage are highly dependent on the severity of the initial hemorrhage. Although researchers have attempted to adjust for differences in pretreatment prognosis, it is not possible to ensure that adjustment is adequate to compare results in different case series. Thus, comparison of results of case series of procedural risk in ruptured aneurysm treatment should be avoided. As with all procedures, risk is affected by patient selection, technical expertise, and supportive services, and its measurement is influenced by the definition of the outcome and the judgment of the evaluator. Descriptions of retrospective case series, which dominate the literature on procedural risk of intracranial aneurysm treatment either by surgery or by endovascular coiling, should be considered skeptically given potential sources of bias and will be reviewed only briefly. Comparative studies that include patients treated by both modalities are more likely to assess outcomes impartially and may provide more reliable comparisons of surgery and endovascular coil embolization. Results of randomized trials of adequate size are not currently available. A recent meta-analysis of surgery for unruptured intracranial aneurysms included results of 2460 cases described in 61 reports published between January 1966 and June 1996. The mortality rate was 2.6% and permanent morbidity was 10.9%, which was variably defined in the included reports. A large, international prospective study of unruptured aneurysm treatment included 995 surgically treated patients. At 1-year follow-up, surgical mortality was 3.2%. Disability was present in 12.0%: 5.8% had moderate or severe disability and 6.1% had isolated cognitive impairment. Thus, the combined morbidity and mortality rate with surgery for unruptured cerebral aneurysms was 15.2% at 1 year, or 9.0% when limited to moderate disability or worse. Cognitive function has not been measured carefully in other studies. The procedural risk of endovascular coil embolization was recently reviewed in a meta-analysis of case series reported from January 1990 through March 1997. Ninety patients with unruptured aneurysms were included, of whom 73 had follow-up evaluations. The mortality rate was 1.4% and an additional 1.4% had moderate or severe disability, but these rates are unreliable given the small number studied. In addition, 16.7% were noted to have ischemic complications, which resulted in a permanent deficit in 6.7%. The combined permanent morbidity and mortality for endovascular coiling was therefore 8.1%, or 2.8% if limited only to moderate disability or worse. Although a large, international prospective study of unruptured aneurysms included a number of patients treated with coil embolization, results for this procedure have not been published, and whether coil embolization impacts cognitive function is unknown.